Do you wish you could get your studio’s customers to pay more regularly? Maybe even get them to pay early? It would sure save you time and frustration. Here’s a way to use ClassJuggler’s built-in email tools to do just that. To demonstrate how you can improve customer billing using our email tools, let’s look at two real-world examples, both from ClassJuggler client Amy Forde, demonstrating how she uses the ClassJuggler email features to improve payment processing at her studio Let’s Dance. Thanking your customers for timely payments is likely to encourage repeat positive behavior. Publicly thanking those customers who pay in a timely fashion (rather than sending them a private thank you message, which the email system also allows you to do) creates a healthy form of peer pressure. She even mentions those who pay early on a regular basis by name further down in this email. With or without the mention of names, and email like this to all parents effectively communicates that paying on time or early lets you be in with the in crowd. As the highlighted sentence shows, Amy has gone a step beyond thanking them, even rewarding them by allowing only those who have been paying on schedule to receive a discount on their summer classes. This not only hammers home the message that timely payments are beneficial to all parties, but will likely significantly increase enrollment in these summer classes and camps she is offering. The price savings for responding promptly is significant. A rapidly approaching deadline (she sent this email three days before the deadline) encourages customers to take immediate action. ClassJuggler’s built-in email tool has many powerful features, such as filtering recipient lists, special formatting, etc., but no software feature will ever be as powerful as business savvy, as these two real-world examples above show. Do you have examples of your own in which you were able to motivate customer payments – examples that other studio owners could benefit from? By all means, please share! Use the comment field below to do so. P.S. : If you are new to ClassJuggler, check out the full range of our powerful business management tools for dance studios, martial arts dojos, cheer/gymnastic schools, and other class-based businesses who want to spend more time with students, less time with the business of running the business. This entry was posted in Cheer ClassJuggler, ClassJuggler Dance, ClassJuggler Dojo, ClassJuggler Fitness, ClassJuggler for Franchises, ClassJuggler K-12, Music ClassJuggler, Product Info, Swim ClassJuggler and tagged class-based business marketing, ClassJuggler, e-mail marketing on May 29, 2014 by classjuggler. Marketing Tip: Connect Your Website to Your Social Media Sites! Here’s a quick marketing tip for your studio’s website – one that will also help you connect better with your customers. As part of getting to know our ClassJuggler clients better, we’ve been researching your businesses online via your websites. The information you post about your business helps us to accurately represent you when we feature you on our social media pages as our Customer of the Week feature. While doing this, we’ve noticed that many of you who have not only a business website but also social media sites (Facebook, Pinterest, YouTube, Twitter, etc.) do not mention your social media sites on your school’s website. If you don’t let your website visitors know about your social media sites, you’re missing a grand opportunity. Whether you put links to your social sites simply in the text of your website’s About page or, even better, put icons that show up on every page (see example to the right from the ClassJuggler site), it’s valuable to put this information somewhere. Your social sites are not just useful for increasing backlinks to your site (which can boost your search engine results page position) but are also a great way to connect to your students and parents. So, make sure they know about your presence on social sites from your website — the place they will likely use first to find your business! This entry was posted in Cheer ClassJuggler, ClassJuggler Dance, ClassJuggler Dojo, ClassJuggler Fitness, ClassJuggler for Franchises, ClassJuggler K-12, Music ClassJuggler, Studio Marketing Tips, Swim ClassJuggler and tagged business marketing tips, dance studio marketing, gymnastics class marketing, social media marketing on May 29, 2014 by classjuggler. It’s hard to imagine an easier way to make $50 than this; if you are a current ClassJuggler client, we will thank you for persuading other businesses (such as dance studios, gymnastics schools, swim classes, martial arts dojos, cheer camps, art schools, tennis camps, K-12 schools, etc.) to sign up and become a customer by sending you a cool $50. So, if you love how ClassJuggler has made the business of running your studio more efficient and more powerful, tell other studio owners. 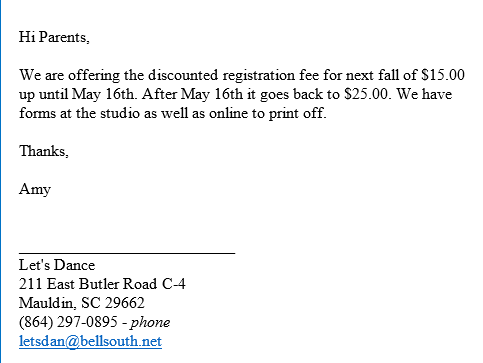 Have the studio you referred enter your name and business name as their “Referral” when they fill out the online form to sign up, and we will send you $50 to show our appreciation. Easy money! You can get full details and terms for referrals on our fees policy page. This entry was posted in About ClassJuggler, Cheer ClassJuggler, ClassJuggler Dance, ClassJuggler Dojo, ClassJuggler Fitness, ClassJuggler for Franchises, ClassJuggler K-12, Music ClassJuggler, Swim ClassJuggler on May 28, 2014 by classjuggler. Whether you’re a brand new ClassJuggler customer or a seasoned client, you may have questions on how to best utilize ClassJuggler for your business. Quality and timely customer support is important to our customers, so it’s important to us! You can reach a ClassJuggler Customer Support Specialist by calling toll free (866) 214-6128 or emailing us at support@classjuggler.com. Our support hours are Monday through Friday, from 8am-5pm Pacific. For our customers outside the U.S., we also offer Skype chat for support help. If you’ve got questions and would like to speak with someone in person, just email us and we’ll arrange a time to connect with you. This entry was posted in About ClassJuggler, Cheer ClassJuggler, ClassJuggler Dance, ClassJuggler Dojo, ClassJuggler Fitness, ClassJuggler for Franchises, ClassJuggler K-12, Customer Support, Music ClassJuggler, Swim ClassJuggler on May 13, 2014 by classjuggler.